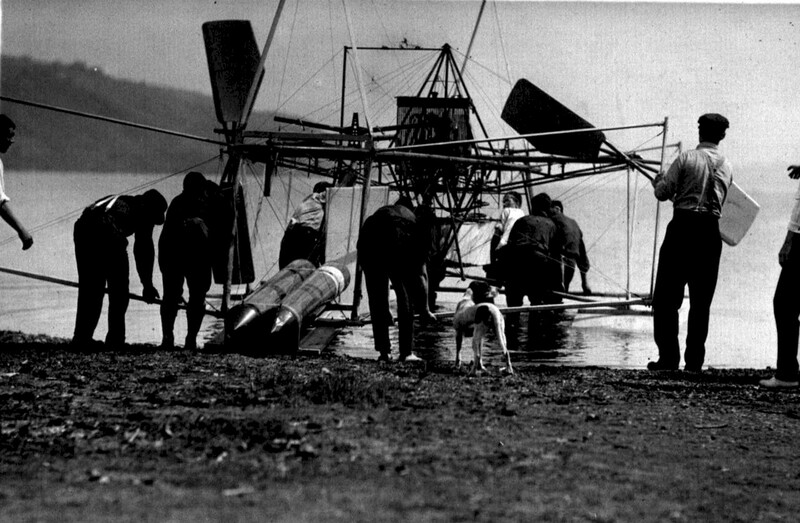 n Hammondsport, Curtiss’ workmen had been working exclusively on the “America,” a flying boat designed to make a record-setting flight across the Atlantic Ocean. Curtiss had them set this aside and everyone concentrated on the Aerodrome. Charles Manly, who had built the Aerodrome engine, joined the team along with Albert Zahm, who was the Smithsonian’s on-site representative. They briefly discussed building a copy of the original catapult Langley had used in 1903, but decided it would save effort to launch the Aerodrome from pontoons. The team struggled mightily to get the Aerodrome ready on time, but was plagued by unanticipated problems. The airframe was much weaker than expected and had to be strengthened. 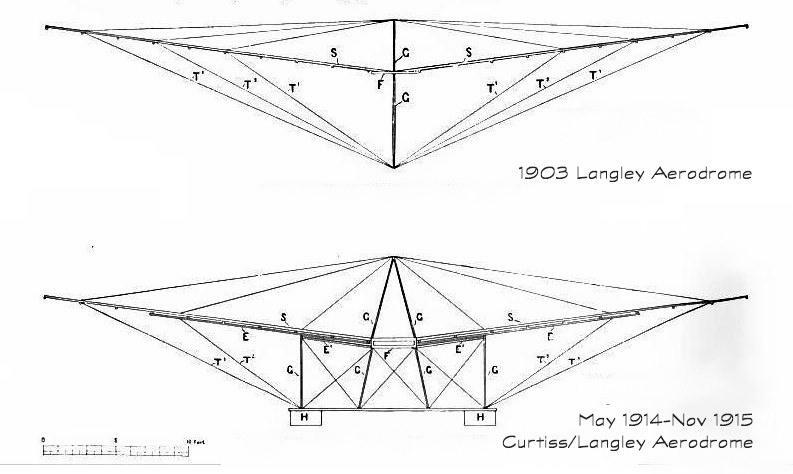 In addition to replacing the ribs and adding spars, Curtiss extended the outriggers that mounted the pontoons, adding wire rigging between the outriggers and the wing spars much the same way the upper and lower wings of a biplane are rigged. This created a trusswork that braced the wings for about a third of their length. The old Manly-Balzer engine would not operate properly and the propellers did not produce enough thrust. Curtiss replaced the original dry-cell battery ignition with a high-tension magneto, and the primitive box-shaped drip carburetor with a modern float-regulated carburetor. Still the engine would not produce the necessary RPMs, so Curtiss trimmed the propellers to give them a more modern shape with less drag. The original controls were two small wheel-cranks beside the pilot’s seat. The forward wheel moved the "steering rudder" beneath the aircraft left and right for yaw control; the rear wheel moved the Penaud tail up and down for pitch. There was no roll control; Langely had depended on a pronounced dihedral angle between the wings to provide roll stability. These controls could not possibly respond in time to what Curtiss knew to be the demands of aviation, so he replaced them with a standard Curtiss wheel, post, and yoke. He linked the rudder to the yoke at first, and then switched to the wheel. The tail was linked to the control post. Eventually, he locked the rudder in place and modified the Aerodrome’s Penaud tail to move side to side as well as up and down. By the time Curtiss had worked out these solutions, Langley Day had come and gone. He was not confident enough to attempt his first mission – to show that the Aerodrome might have flown in 1903 – until late May. By this time the Aerodrome was no longer the same aircraft it had been in 1903; even a casual comparison of photos that Brewer and others took in June 1914 with those taken of Aerodrome in 1903 shows this to be the case. (Compare the 1903 and 1914 Aerodrome drawings HERE.) But Curtiss, Walcott, and the Hammondsport team would say that it was close enough, some of them until they day they died. Curtiss made a few straight-ahead hops on May 28, June 2 and June 5, none lasting more than a few seconds. These were not the results he and Walcott had hoped for, but the media had their story and the photos to support it. Walcott was quick to press the political advantage. Within a week – 11 June 1914 – and while these news stories were still fresh in the minds of legislators, House Minority Leader James R. Mann of Illinois read into the Congressional record the results of the Hammondsport trials. He then asserted the need to “provide under some scientific bureau of the Government some means for further investigations and experiments with regard to heavier-than-air Machines.” Mann intimated that this “scientific bureau” should be under the direction of the Smithsonian Institution, as suggested by its Secretary. He also mentioned a dollar amount, “…$50,000 to continue investigations along the line of aeronautics under the Smithsonian Institution.” Nothing was decided, but the point was made. 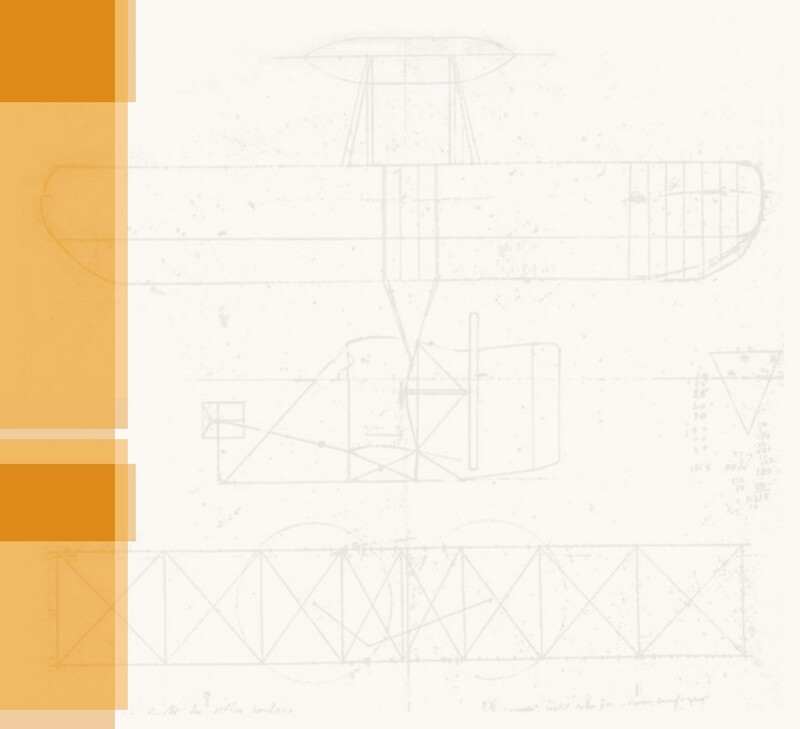 As for Curtiss, he set the Aerodrome aside for a few weeks while he ramped up the America project again, and then began the second part of his mission – to see what value, if any, the tandem wing configuration might have for modern aeronautics. The tests continued, albeit at a more leisurely rate and under new management. When he was certain the America was back on track, Curtiss bowed out and went to Buffalo, New York to set up a new factory. Albert Zahm took over the testing of the Aerodrome. It was apparent to all who attended the initial test flights that the original Manly-Balzer engine didn’t have the oomph to get the Aerodrome in the air and keep it there. Among the first things that Zahm and his crew did was swap out the old radial for a new Curtiss 80 hp V-8. They also scrapped the twin pusher propellers and replaced them with a single tractor screw. Flights resumed in September of 1914 and the Aerodrome performed much better. Curtiss pilot Gink Doherty was able to keep the machine aloft for distances up to half a mile, reaching an altitude of 30 feet. And the machine continued to evolve. Zahm and crew experimented with its center of gravity, control linkages, the diameter and pitch of the propeller, number and position of the pontoons, the length of the secondary spars, and a dozen other details. In March 1915 while Lake Keuka was still frozen, they swapped the pontoons for skates, reducing weight and drag. 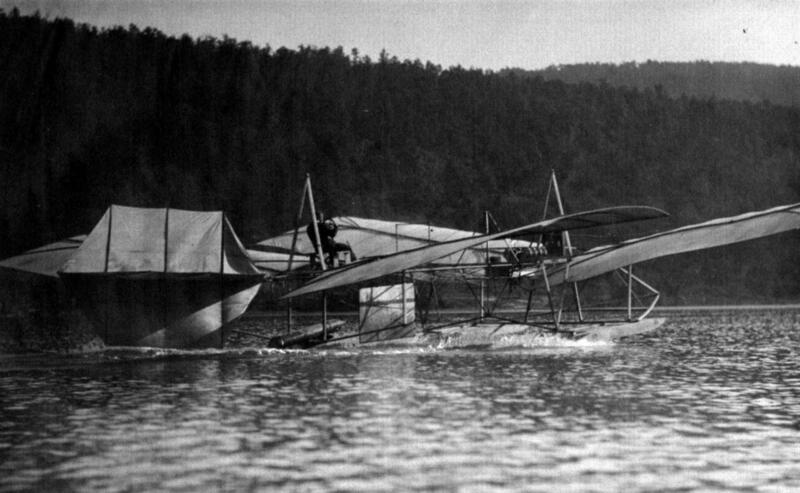 Eventually they were able to fly 20 miles – the length of the lake. 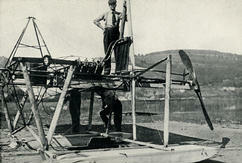 But throughout all this experimentation, the Curtiss team was never able to navigate the Aerodrome. Of the three pilots who eventually flew the aircraft – Glenn Curtiss, Elwood Doherty, and Walter Johnson. – none ever made a successful turn of more than a few degrees. 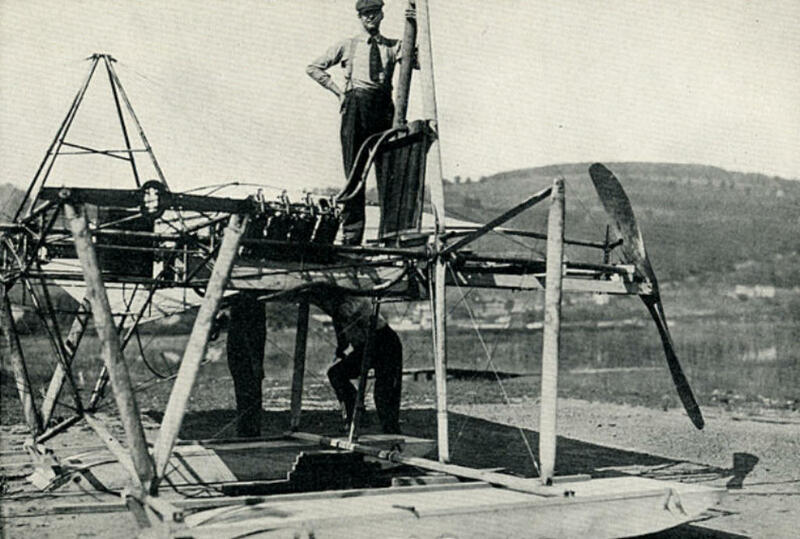 In early June of 1915, Orville’s brother Lorin visited Hammondsport under an assumed name and observed several Aerodrome flights before he was found out. As luck would have it, he witnessed a flight in which the rear A-frame that supported the wing rigging were swapped out for something approaching the original guy post. 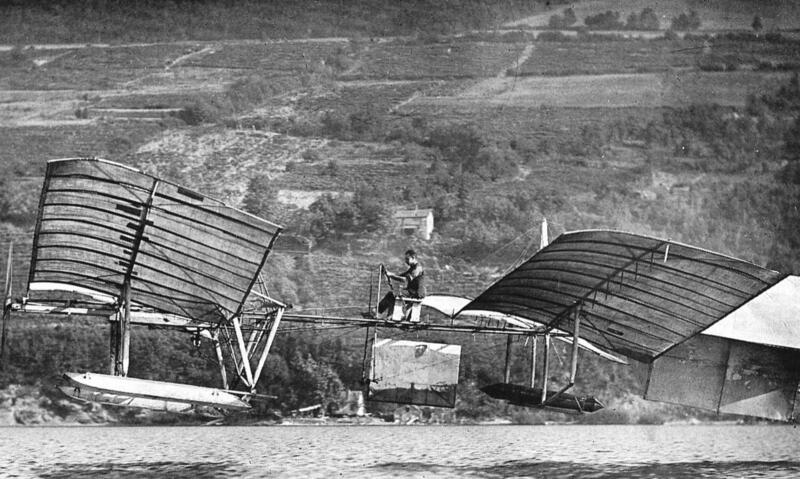 The back wings collapsed in flight, just as they had during a launch attempt in 1903. The photographs he took were confiscated, but he was able to note this change and many others that had been made to the Aerodrome up to that time. And there were probably more changes after that. The flight tests continued until November 1915 when Curtiss called a halt. The Aerodrome was disassembled, packed up, and returned to the Smithsonian. 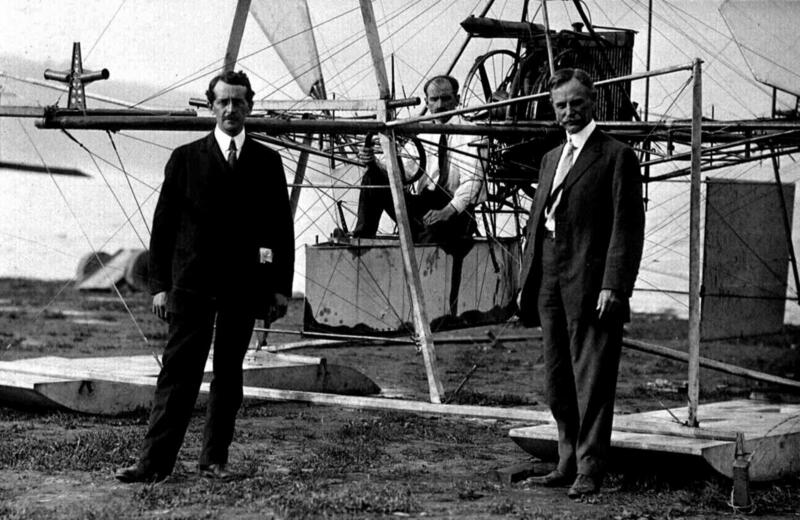 Left to right: Charles Manly, Glenn Curtiss, and Albert Zahm with the rebuilt airframe of the Aerodrome. 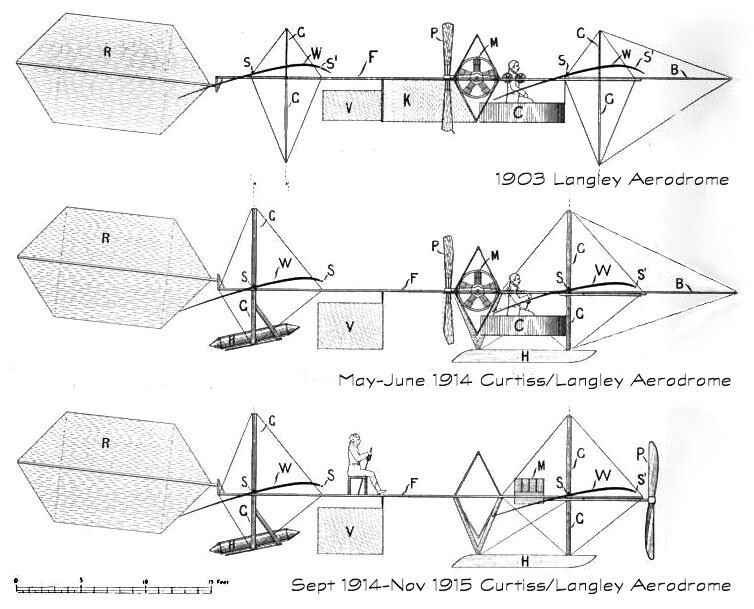 These drawings by Griffith Brewer show the rigging of the original Aerodrome and the rigging of rebuilt Aerodrome that was flown by Curtiss. This "taxi test" (without wings) on 27 May 1914, clearly shows the extensions to the airframe that helped brace the wings. After the June 1914 flights, the original Aerodrome engine and pusher propellers were replace with an 80 hp Curtiss motor turning a single tractor airscrew. The Aerodrome on a take-off run on September 17, 1914 with a new engine and propeller. Note the tail dragging in the water. The tail was later raised not only to keep it from getting wet but also to give it greater freedom of movement. The position of the pilot was also changed. Note that the shoulder yoke has been removed, the pilot is using just the wheel and the post to steer the aircraft. In all, three pilots flew the modified Aerodrome – Glenn Curtiss, Elwood "Gink" Doherty (shown), and Walter Johnson. 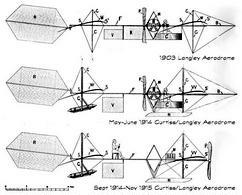 Top: The original configuration of the Aerodrome. Middle: The aircraft during the first phase of the Hammondsport tests when Curtiss and Walcott were trying to show that the "original" Aerodrome was airworthy. Bottom: The aircraft during the second phase when the "tandem configuration" was tested. Comparing the 1903 and 1914 Aerodromes – Explore 3D models of the Langley Aerodrome -- the original 1903 Aerodrome, the 1914 reconstruction, and a composite of both the 1903 and 1914 machines, showing what parts were discarded or added in the reconstruction. Recent Adobe Reader software (version 9.0 or later) allows you to view 3D-PDF files and zoom, pan, slide, and turn the digital models to see them from any angle, close up or far away. A detailed 3D digital model of the 1903 Langley Aerodrome.